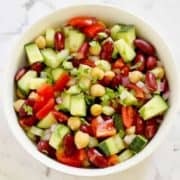 This Middle Eastern Bean Salad is healthy and delicious, and perfect for picnics, BBQs and potlucks. 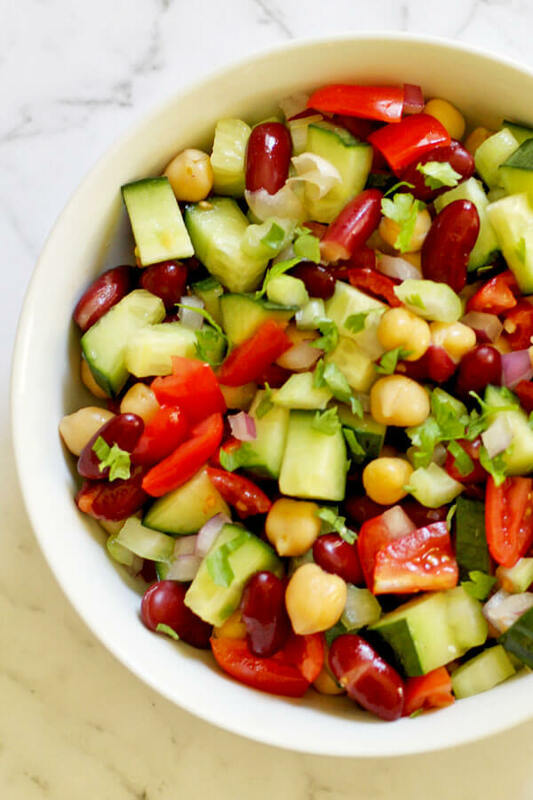 Filled with fresh ingredients including chickpeas, kidney beans, cucumbers and cherry tomatoes, and topped with parsley and a lemon vinaigrette. We visited a few countries in the Middle East on our honeymoon last year and I quickly fell in love with the cuisine. Not that I was surprised – I’ll take any excuse to eat dip with every meal! I particularly enjoyed how much beans were integrated into Middle Eastern cooking. Whether it was a bowl of fava bean soup or a plate of freshly fried falafels, I was in bean-loving foodie heaven. This Middle Eastern Bean Salad is inspired by the various bean salads I tried throughout our travels. It’s a fresh and filling salad that’s filled with good-for-you ingredients. I’ve chosen a basic lemon vinaigrette as the dressing which adds a subtle, tangy flavour to the medley of vegetables and beans. I usually try to leave fresh herbs out of most of my salad recipes since I just hate buying a whole bunch to only use a few leaves. But this salad is the exception as chopped parsley is a worthy addition. This salad is the perfect side of lamb or beef, or even enjoy it on it’s own for an easy take to work lunch. This Middle Eastern Bean Salad can be served either cold or at room temperature, making it great for bringing along to picnics, BBQs and potlucks. The salad will keep in the fridge in an airtight container for a few days, so feel free to make ahead. I’m all for simplicity and saving time so canned beans work well for me. I just make sure I rinse well before putting in the salad. If you would like to use dry beans instead, go for it! 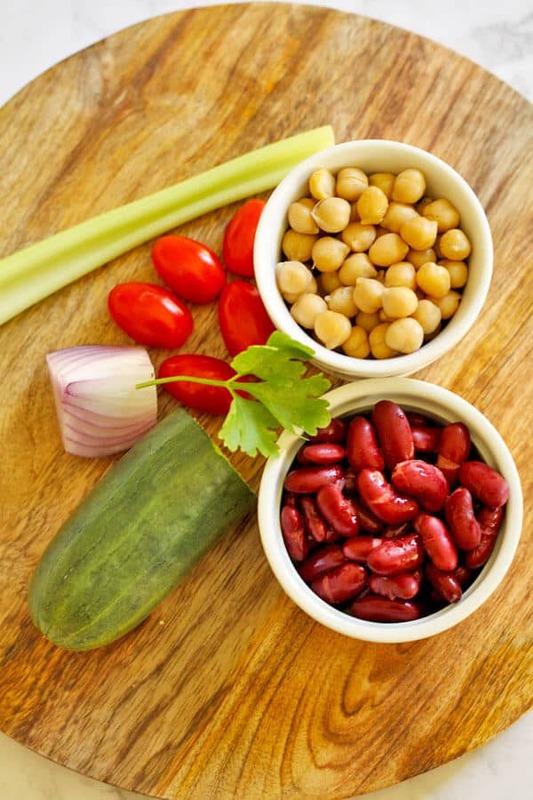 If you’ve tried this Middle Eastern Bean Salad I’d love to hear how you enjoyed it! Pop a comment and a star rating below! You can also FOLLOW ME on FACEBOOK, INSTAGRAM and PINTEREST to keep up to date with more delicious recipes. This Middle Eastern Bean Salad is healthy and delicious, and perfect for picnics, BBQs and potlucks. 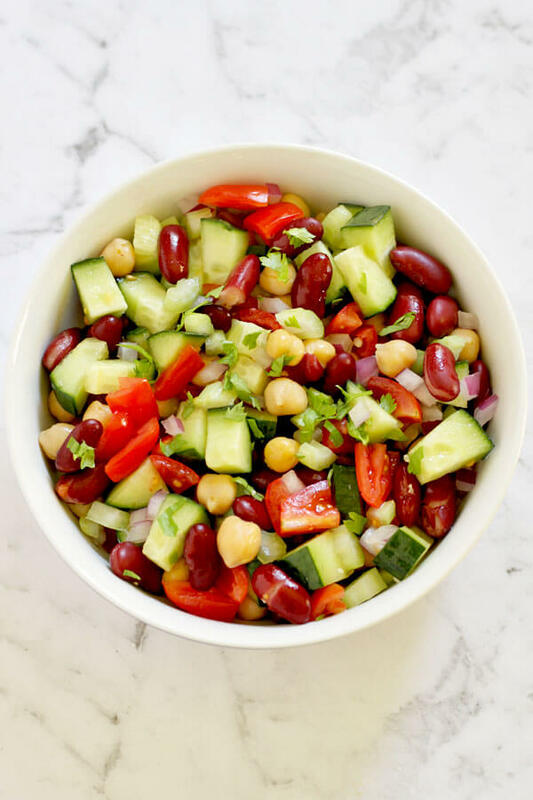 Filled with fresh ingredients including chickpeas, red kidney beans, cucumbers and cherry tomatoes, and topped with parsley and a lemon vinaigrette. Mix EVOO and lemon in a jar and shake vigorously to emulsify. Taste, season with salt + pepper and shake again. Put salad ingredients in a bowl, drizzle dressing on top and toss to combine. Serve and enjoy! Storing - This salad is great served cold or at room temperature, so feel free to make ahead. It will keep well in an airtight container in the fridge for a few days. Beans - Feel free to sub for dry equivalent if you don't want to use canned. Nutrition information is a rough estimate based on one serve. ★★ HAVE YOU MADE THIS RECIPE? PLEASE GIVE IT A STAR RATING BELOW!